Chinese citizens are outraged because Google finally decided to stop censoring their content. A large group of women in Yemen gathered to protest a ban on child brides, arguing that marrying as young as 8 years old is a religious right. Some American Congressmen are receiving violent messages, and even death threats, because they helped to pass universal health care. Evidently, according to opponents of the legislation, expanded coverage will bring on Armageddon. I really feel like I missed something. Laos has the dubious distinction of being “the most bombed country in the world”, a record that no country wishes to hold. The province of Xieng Khuang, where we are currently traveling, is “the most bombed region” in “the most bombed country in the world” meaning we are surrounded by shrapnel, craters, blown up tanks, trenches, and no-growth zones. Missiles, mines, mortar shells, and cluster bomblets litter the landscape. Reminders of the various wars are everywhere including in the local architecture. We saw shells and missile casings decorating stilt houses, shacks, guesthouses and even the local Internet cafe. Talk about surreal. 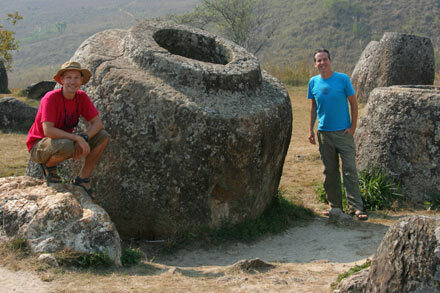 We’ve made our way to Xieng Khuang province to visit the enigmatic “Plain of Jars”, a large highland plain which extends out from Phongsavan dotted with hundreds of giant stone vessels of mysterious origin. 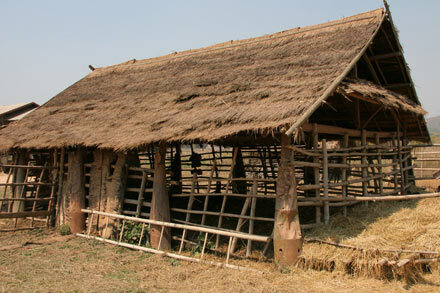 Vang Vieng is Laos’ party central. Think Florida’s spring breakers meet Ibiza’s euro trash – and all amidst a stunning landscape of limestone karst formations. 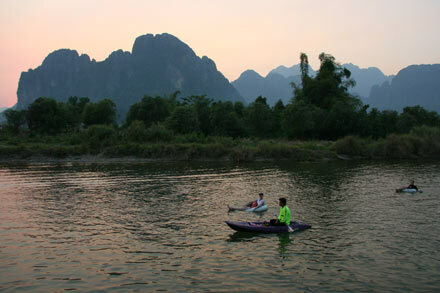 Travelers come here for three reasons: drinking from buckets, tubing on the Nam Song River, and more drinking from even bigger buckets. The party crowd is as ugly as the countryside is beautiful, and perverse curiosity made us break our long journey up North in Vang Vieng. The world is full of crazy geniuses who feel compelled to leave their mark on the world. These odd monuments, products of psycho-savants, reveal everything from extreme religious devotion to an obsessive love of trash. A large number of these bizarre creations are found in the US, including: Carhenge, the Winchester House, the Coral Castle, and the Corn Palace. But odd monuments are not exclusive to America. Back in Berlin we had Molecule Man, the metal monstrosities behind the Tacheles, or the odd mechanical sculptures in the alley next to Hackesche Höfe. India is the proud home of the trash sculpture gardens outside Chandigarh and the Matrimandir and its devotional crystal orb in the hippie-commune of Auroville. …and don’t let the bedbugs bite! 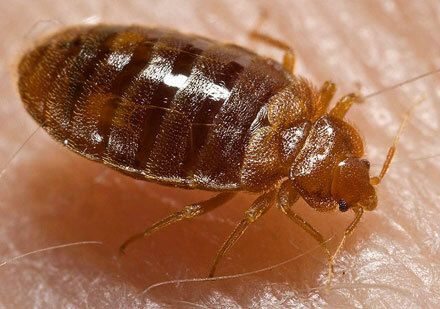 Like I have a choice – bedbugs just love me. 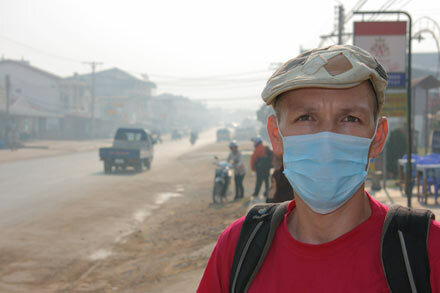 My latest encounter with evil, blood-sucking bedbugs was in Vientiane, the quiet capital of Laos. I blame myself. It had been over a year since I squashed eight of those apple-seed-sized suckers in one night. But that was in far-off India, and Southeast Asia had made me lazy. I should have known better and remembered my lesson: Always check out the mattress before you check in. 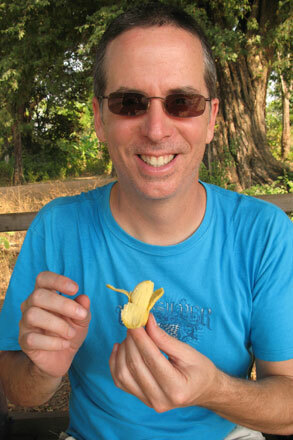 If I needed one specific reason to come to Laos, that would be Kong Lor. Picture a river that twists and turns through rice paddies on its way to a jungle-covered, karst escarpment, a jagged wall of soaring peaks. Entering the jungle, the river heads straight towards the massive limestone walls where it suddenly disappears through a cave opening. Those who dare boat in through the opening into the pitch-black world within winding their way along 7 kilometers (4.2 miles) of underground river through a series of caverns until the river reemerges on the opposite side of the escarpment into the Phu Hin Bun National Protected Area. Â Reminiscent of Jules Verne’s greatest journey, Kong Lor beckons the adventurer with the lure of a boatride into the underworld and visions of epic adventure beyond. 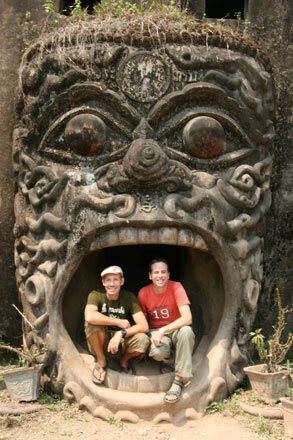 If I needed one specific reason to come to Laos, that would be Khong Lor. Picture a river that twists and turns through rice paddies on its way to a jungle-covered, karst escarpment, a jagged wall of soaring peaks. Entering the jungle, the river heads straight towards the massive limestone walls where it suddenly disappears through a cave opening. 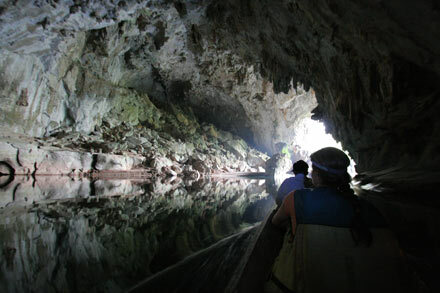 Those who dare boat in through the opening into the pitch-black world within winding their way along 7 kilometers (4.2 miles) of underground river through a series of caverns until the river reemerges on the opposite side of the escarpment into the Phu Hin Bun National Protected Area. Reminiscent of Jules Verne’s greatest journey, Khong Lor beckons the adventurer with the lure of a boat ride into the underworld and visions of epic adventure beyond. 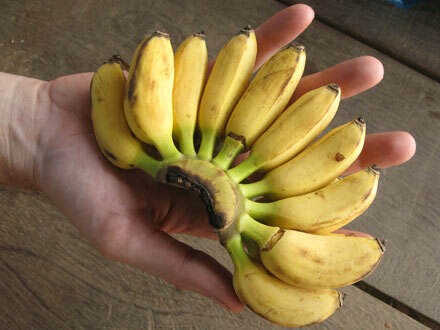 Just when I thought I had seen every kind of banana – yellow, green, red, bent, straight, big, small – I came across the smallest bananas imaginable. They were so small that ten of them fit comfortably into Tony’s palm. What was so fascinating, however, wasn’t the microscopic size but that it took Tony several bites to finish one off. Travelers visiting Cambodia and Laos are often shocked to discover a strange picture of American military men holding a 25-foot “Naga.” This mysterious animal, named after the legendary Hindu serpent deity, is said to have been pulled out of the Mekong by the American soldiers in Laos in 1973. Wow, that’s incredible! Except that it’s not true. In reality, the picture is far more domestic in origin than I would have imagined. The picture shows American military men in my home region of Southern California holding an oar fish. Although I’m a diver, I had never even heard of an oar fish until I started researching the picture on the Internet. Now, I realize there is yet one more amazing animal that I have to put on my must-see list.